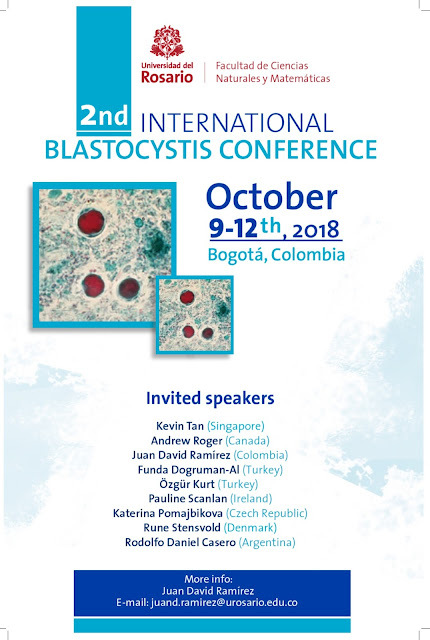 It's official - The 2nd International Blastocystis Conference! It's been a while, but I hope the wait has been worth the while! On behalf of the organisers, who currently include Juan-David Ramírez, Funda Dogruman-Al, and myself, we would now like to announce the dates, venue, and speakers for the 2nd International Blastocystis Conference! Feel free to be mesmerised! Juan-David Ramírez just sent me the 'teaser' below - and this blog is an obvious place to share it. We are very happy that so many "heavy Blastocystis researchers" have accepted our invitation to participate! However, we already now know that we will be missing some very important ones. Well, you can't have it all, and we're absolutely sure that the event will be a BLAST(ocystis)! There will be a two-day workshop (9th–10th of October) followed by a two-day conference (11th–12th of October). On the Friday, the 13th of October, it will be possible to participate in a one-day sightseeing event in Bogotá. So, if you haven't done it already, make sure that you sign up for notifications from the Blastocystis Parasite Blog (here or on Facebook) in order to keep up with the latest information on abstract submission deadlines, programme, practicalities, travel grants, etc. We are also on the lookout for sponsors, so if you have any suggestions, please contact me. We are looking very much forward to seeing you in Bogotá in 2018!